Thyatira - Truth or Tolerance? This sermon examines the important lessons we can learn for our time from the ancient church in Thyatira, as described in the Book of Revelation. Imagine being a part of a church that is friendly, open and inviting. A church that was growing and constantly getting better. A church that is renowned for its acts of service, faith and love. Would you want to be a part of that church? Today we are going to look at Christ’s message to a church just like I just described... the church of Thyatira. Let’s start off by turning to that message in Revelation 2. We’re continuing a series today that we have been doing, going through the seven messages to the churches in the book of Revelation. So far we’ve talked about the church of Ephesus, Smyrna and Pergamos. Today we are looking at number 4 - the church of Thyatira. Well, there it is. The message to the church in Thyatira. There's quite a lot in there, and when I read through this a couple months ago, knowing this was next in the series, I was like... Whaaaaaaaaaaat? In the world does this mean? Where do we start and how could this message, in any way, apply to us today? I think that as we go through this, you will see that Thyatira was in many ways VERY similar to where we are today here in Australia. It's a fascinating message, I really enjoyed going through this and I hope you'll enjoy going through it with me as well. First, we’ll look at three characteristics about the city of Thyatira itself. Secondly, we’ll dig deeper into the core of this message and try to really unpack the essence of what is being said by asking the question... Who was Jezebel? And then, once we’ve laid the groundwork and done those two things, we’ll finish by going through this message again and see if it makes more sense, and if we can take away something to think about regarding our own lives. Lets jump right in and get started with that first part, by looking at three things characteristics of the city of Thyatira itself, back when this letter was written. If you look at a map of the seven churches of Revelation (which is modern day Turkey). There is believed to be an ancient mail route which went through Ephesus, Smyrna, Pergamos and then back through down through Thyatira, Philadelphia and Loadicea. Ephesus was a really big commercial centre, it was like the Sydney of that time and area. Pergamos was the political centre, so like the Canberra of its day in Australian terms. Thyatira was about 65km South East of Pergamos. Now both Pergamos and Ephesus would trade with countries to the north and east, and Thyatira was like a refueling stop along the way. I couldn't find exact maps of this era, but it looks like Thyatira was where North-South and East-West roads intersected. So if Ephesus was like Sydney, and Pergamos like Canberra, then Thyatira was like a big BP station back then. People would stop by there as they were passing through. The result of that location, and the first characteristic of Thyatira that I want to focus on today, is that the population of Thyatira was very multicultural. There would have been a large variety of different nationalities and races living in Thyatira that had come from all over, multiple countries. And because of that, there would have been multiple religions, philosophies and cultures. Trade guilds were the unions of the day - groups of different craftsman and craftswoman would join together to form a guild. So, there was the guild of bronze makers, of silversmiths, of bakers, of garment manufacturers, leather workers and of fabric dye producers. 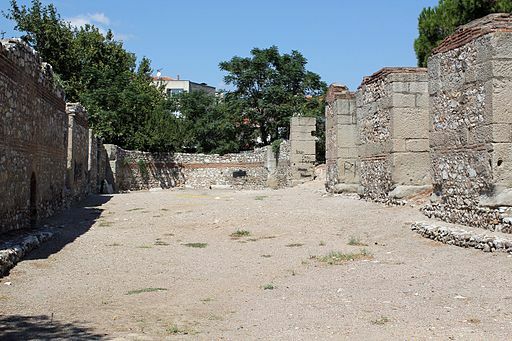 Again, it’s location as a place where lots of people would pass through, set up the city to be a large trading centre and excavations of the city have uncovered references to multiple different trade guilds in Thyatira. Trade guilds are mentioned more often in Thyatira than any other city in Asia Minor. On one of Paul’s journey’s he encounters a woman named Lydia. I believe that was in the city of Ephesus. He meets and ends up baptizing Lydia and she is labelled Lydia of Thyatira, seller of purple. The purple dye is what they would use to dye clothes. It was a centre of commerce and the home of multiple trade guilds. Multiple races and nationalities brought multiple different gods and religions. Each trade guide had its own god that it followed. At the time that John wrote the book of Revelation, Apollos was the patron god of the city of Thyatira. Apollos was a Greek god who the Romans had adopted into their pantheon of gods. He was considered the god of the sun, and was the son of Zeus. (Remember that for later too... Apollos was the son of Zeus). Apollos was not the only god they worshipped in Thyatira, as I said before each trade guild also had its own god so the city was not exclusive to one god alone. They would worship multiple gods and they were okay with that. They tolerated all of those different gods. Multiple gods were tolerated and worshipped in Thyatira. That is the setting that this church we read about here in Revelation, found itself. Now that we understand a little bit about the city of Thyatira itself, what we’ve talked about so far still doesn’t really unlock the meaning of this message to this church. We still need to dig a little deeper. What we need to understand better, to really break this message wide open is to figure out... Who is this Jezebel it is talking about in the message to Thyatira? Who was this Jezebel that it’s talking about here? This is a fascinating study, but let’s start out with full disclaimer - the honest truth is no one knows who exactly this Jezebel mentioned here is referring to. We can’t dogmatically say we know exactly who she is. That being said, let me give you some possibilities as to who this Jezebel is. Even though we aren’t going to definitively identify Jezebel, I think you will find this helpful in trying to understand this message to this church. Now the first option regarding who this Jezebel figure is in Christ’s message to this church is that someone within the church (probably a woman, but maybe not) was claiming to be a teacher and was taking this church in the WRONG direction... similar to what Jezebel did to Israel hundreds of years earlier. This is, I think, the most plausible option, and certainly the option that will allow us to draw some takeaway lessons that we can apply to our lives today. The influence that Jezebel had on the King - King Ahab himself. I want to take some time here and really set the stage. For myself, hearing these stories growing up, we can read over things and easily dismiss what happened as "Oh, there go those wicked silly Israelites again, always doing something silly..."
The story of Jezebel and Ahab. Remember how King David ruled Israel, then his son Solomon and then after Solomon the kingdom split into two? The south kingdom was ruled by Rehoboam, son of Solomon. Jeroboam was the ruler of the North kingdom. Jeroboam was worried that if the Northern Israelite tribes returned to Jerusalem in the South to worship God, they would return to the house of David (Rehoboam) as their king. “It is too much for you to go up to Jerusalem. Here are your gods, O Israel, which brought you up from the land of Egypt!” 29 And he set up one in Bethel, and the other he put in Dan. 30 Now this thing became a sin, for the people went to worship before the one as far as Dan. I’ve always read this and just assumed here, that Israel was completely turning away from God and replacing God with other gods. HOWEVER, the word for gods here is Elohim (Strong’s word h0430) the same Hebrew word that back in Genesis is used when it says, And God (Elohim) created the heavens and the earth. It’s also interesting that Jeroboam made TWO golden calves. What Jeroboam is doing here, is trying to connect the people of Northern Israel to God by creating these idols. You don't have to go to Jerusalem to worship God, we have these two idols right here! Maybe the idols were physical representations of God, or maybe even God’s throne. He’s not changing the God they worship... he’s changing the way they worship. Why do we have to do it the way we’ve always done it? Why travel all that way to be with those tradition obsessed southerners? We up here in the North are so much more modern. We are the progressive people up here. We are so much more enlightened than our southern neighbours. Maybe this happened all at once, or maybe it was a gradual slip over the years. We know that Jeroboam ruled over Israel for a total of 22 years. One thing is for sure - at the end of those 22 years, at least for the Northern Kingdom of Israel, the TRUTH of how to worship God had been lost. Then, after Jeroboam, each successive king did a little more evil in the sight of the Lord. Jeroboam’s son Nadab was king number 2. More truths of God were allowed to slip away. Soon, Jeroboam’s son and his entire line was wiped out by Baasha of Issachar who took over the rule of the Northern Kingdom. He was the third king. The son of Baasha, named Elah, was number 4 king. He was wiped out by Zimri - a chariot commander who murdered Elah and his family in their palace. He set himself up as king of Israel. Zimri reigned for 7 days before the army chose Omri, the commander in chief of the army, to be the King of Northern Israel and set siege to the city that Zimri was in... Zimri set fire to the city and killed himself. So Omri was king in his place, although he had to dispute the throne from another claimant for the first 4 years of his reign. I’m trying to emphasize here that time and generations have passed from Jeroboam changing the way Israel worships God, up to this point. 25 Omri did evil in the eyes of the Lord, and did worse than all who were before him. 26 For he walked in all the ways of Jeroboam the son of Nebat, and in his sin by which he had made Israel sin, provoking the Lord God of Israel to anger with their idols. So far, it appears, that Israel is still trying to worship God Himself, even though they are doing it completely wrong, using idols and provoking God to anger. Only 12 verses tell us about king Omri. However, Bible archaeology tells us that Omri was one of the most powerful rulers in Israel and he established the second longest dynasty in the Northern Kingdom, at 45 years. Now, with all of this backdrop and these generations of kings all slipping a little bit further from the Truth, we come to king Ahab. 29 In the thirty-eighth year of Asa king of Judah, Ahab the son of Omri became king over Israel; and Ahab the son of Omri reigned over Israel in Samaria twenty-two years. 30 Now Ahab the son of Omri did evil in the sight of the Lord, more than all who were before him. That phrase seems strange, but what it’s saying is: As if the idolatry of Jeroboam wasn’t enough of a sin for Ahab, he decides to go a step further... What was that step further? that he took as wife Jezebel the daughter of Ethbaal, king of the Sidonians; and he went and served Baal and worshiped him. It’s here, under the rule of King Ahab, that Israel undergoes an important turning point in its history. They go from using idols and coming up with their own ways to worship the true God... to worshipping a different god altogether. This verse describes this shift like an instantaneous thing (and it could have been) - he marries her and he worships Baal, all at once. But remember that there has been this gradual generational shift in previous decades, the slow drift away from God's Truth which has set the stage for this moment here, when Jezebel enters the story. 32 Then he set up an altar for Baal in the temple of Baal, which he had built in Samaria. 33 And Ahab made a wooden image. Ahab did more to provoke the Lord God of Israel to anger than all the kings of Israel who were before him. How did Israel and how did Ahab himself, take that leap from at least trying to worship God, to worshiping Baal? The answer is this woman Jezebel. They were called transcultural, or spreaders of culture. Not necessarily developing much of their own culture, but picking up cultures from elsewhere and spreading it to other nations. Worshipped Baal and Ashteroh, however, were tolerant of other gods. Jezebel was the daughter of Ethbaal - probably king and also the high priest of religion to Baal. Knowing that Jezebel came from that type of tolerant culture, how would she have reacted to becoming a part of Israel? As she started to get to know Ahab and Israel, she would have been inquisitive I would think, and tried to understand this God of Israel that was worshipped in her new home. This is NOT the type of God Jezebel was used to. So after learning a little about the God of Israel, Jezebel would have gone to work on Ahab and the Northern kingdom of Israel. She would have said something like "I’ve found getting to know YOUR God has been a fascinating process. Please allow me to teach you about mine..."
After years and generations of Kings letting the truth of God slip, the key question that Jezebel would have planted in Ahab’s mind is: "How do YOU know your God is the only one? How do you know His way is the only way? After all, who are you to say your culture is superior to mine?" "You have a temple to your God, Ahab, let me build a temple to mine as well." "You know what Ahab, why don’t you just come down and check it out one day? Unlike your God, we include everyone... You're welcome here. You can worship your God AND you can worship mine." Why not have both? The truth is relative, depending on your perspective. In a way, Israel had been marching towards this inevitable conclusion for years. Jezebel just pushed them over the edge. No longer do you have to be confined to one God’s perspective of truth. Why not explore them all? This path that Israel took is very similar to what we find in Thyatira at the time of this message we read to the church, with the tolerance of multiple gods... AND it’s very similar to where our society is going today in Australia. It wasn’t long ago that the US (where I grew up) and Australia identified as Christian nations. Christian principles, you might even say Christian truths, underpin our societies. But those foundations have been subtly under attack in the post-modern era of the last few decades. Truth, in our society is no longer absolute. Instead we see an individualistic moral relativism that has taken its place. In 1521, Henry the 8th, King of England, was crowned by the pope as the “DEFENDER OF THE FAITH”, and every monarch of England since has carried that title. “I personally would rather see it as Defender of the Faiths (plural), not THE faith.” He said. Andrew Pierce. 2008. Prince Charles to be known as Defender of Faith. [ONLINE] Available at: http://www.telegraph.co.uk/news/uknews/theroyalfamily/3454271/Prince-Charles-to-be-known-as-Defender-of-Faith.html. [Accessed 1 December 2017]. In other words, Truth is Relative, depending on your culture. Maybe we worship God, Baal, Apollo... It doesn’t matter because each is equal. You see this post modern idea in what Prince Charles is saying though. The key point is Who are we to elevate Christianity above these other religions? We must be open and tolerant of all these other faiths. This is the culture that Jezebel brought with her into Israel. This is the culture that we have around us today, and, as we will soon get to, this would have been what Thyatira was battling as well. Notice I Kings 18:20. If your Bible has these little section titles like mine does, you’ll see that this is the famous Mt. Carmel Olympics, between Elijah and the prophets of Baal that Jezebel introduced into Israel. And Elijah came to all the people, and said, “How long will you falter between two opinions? If the Lord is God, follow Him; but if Baal, follow him.” But the people answered him not a word. They couldn’t take a stand, because they had been taught that they could worship both. They had been taught that truth was relative. I searched through these chapters here about Jezebel and Ahab, and I couldn’t find ONE instance where Ahab blatantly rejected or denounced God. Israel had become a culture of TOLERANCE, all views were accepted equally and seen as potential truth. Skip back a couple of verses to I Kings 18:4. If Jezebel brought into Israel a culture of tolerance of all gods, why then do we read this? For so it was, while Jezebel massacred the prophets of the Lord, that Obadiah had taken one hundred prophets and hidden them, fifty to a cave, and had fed them with bread and water. Jezebel is killing the prophets of God... why? I thought she was tolerant to worshipping any God? “Noah Riner wanted to stir up Dartmouth College students with his speech at a convocation ceremony last week suggesting that students' character matters just as much as their intelligence and their talents, and that the college pays too little attention to that aspect of their development. Doug Lederman. 2005. Free Speech at Dartmouth. [ONLINE] Available at: https://www.insidehighered.com/news/2005/09/29/dartmouth. [Accessed 1 December 2017]. The irony... Christian groups are allowed access into college campuses, more than in the past... however, if that Christian group maintains that there is some sort of exclusive element in Christianity, which implies that others are in some measure wrong, that place is quickly withdrawn and they are ostracized." “The grounds for withdrawal are not, formally speaking, that the Christian is a Christian, but that the Christian is intolerant, which cannot be tolerated. Thus the world of academia exerts not-so-subtle pressures for Christians to develop a form of Christian expression that disowns or at least silences the exclusiveness claims that are grounded in the Scripture itself. The positive side of this situation, of course, is that toleration and subjectivity have become the principal virtues of our age, meaning that marginal groups, even evangelicals, are accorded far more respect than they were earlier in the century. The danger... is that the gentle lamb of toleration often returns as the wolf of relativism. Christians, then ,are both better off and worse off; better in that they are tolerated like everyone else, worse in that no claim to truth carriers weight any longer." Carson, D., 2012. The Intolerance of Tolerance. 1st ed. Grand Rapids, Michigan: William B. Eerdmans Publishing Company. Pages 29, 33. Why did Jezebel - the queen of tolerance of all gods - put to death the prophets of God? Because they committed the unpardonable sin of INtolerance. They claimed that they ALONE preached the truth. "In 1987, Allan Bloom wrote a book called “The Closing of the American Mind.” The core argument was that American campuses were awash in moral relativism. Subjective personal values had replaced universal moral principles. Nothing was either right or wrong. Amid a wave of rampant nonjudgmentalism, life was flatter and emptier. Bloom’s thesis was accurate at the time, but it’s not accurate anymore. College campuses are today awash in moral judgment. Many people carefully guard their words, afraid they might transgress one of the norms that have come into existence. Those accused of incorrect thought face ruinous consequences. When a moral crusade spreads across campus, many students feel compelled to post in support of it on Facebook within minutes. If they do not post, they will be noticed and condemned. Some sort of moral system is coming into place. Some new criteria now exists, which people use to define correct and incorrect action. The big question is: What is the nature of this new moral system? Crouch starts with the distinction the anthropologist Ruth Benedict popularized, between a guilt culture and a shame culture. In a guilt culture you know you are good or bad by what your conscience feels. In a shame culture you know you are good or bad by what your community says about you, by whether it honors or excludes you. In a guilt culture people sometimes feel they do bad things; in a shame culture social exclusion makes people feel they are bad." "The ultimate sin today, Crouch argues, is to criticize a group, especially on moral grounds. Talk of good and bad has to defer to talk about respect and recognition." David Brooks. 2016. The Shame Culture. [ONLINE] Available at: https://www.nytimes.com/2016/03/15/opinion/the-shame-culture.html. [Accessed 1 December 2017]. Today there are certain beliefs and lifestyles, in our society here in Australia, that if you don’t show tolerance for, if you take a stand against it you will be massacred. Maybe not physically, like Jezebel did to the prophets of God, but socially or even professionally, you will be viciously attacked. On the surface, Jezebel’s teachings sound good - tolerance, inclusiveness, everyone has a voice - but take a stand for the truth and that lamb of tolerance will turn into a wolf. Let’s turn to one more verse about Ahab and Jezebel’s influence on him in 1 Kings 21. I don’t know about you, but I’ve always seen Ahab as this inherently evil king - someone always just diabolically opposed to God. But if you read these verses here, the whole story like we just went through, you can almost feel sorry for Ahab. Ahab is a powerful example of what happens when we let the Truth slip and tolerate ALL opinions as equal. Each generation before him let the Truth slip a little more and a little more, leaving Ahab open for the destructive influence of Jezebel. So... with that now as a background into who Jezebel was and her influence on Israel, let’s now fast forward to Revelation 2 and look one more time at Christ’s message to the church in Thyatira. Some say that this reference to brass is targeting the brass trade guild. Remember the many trade guilds of Thyatira? That is possible I suppose. But one thing I do want to bring out here is that it calls Christ the Son of God. This is the only place in Revelation that particular phrase is used to describe Christ. I would definitely say that this was deliberate here, attacking the concept that the patron god of Thyatira Apollos was the son of Zeus. I think Christ is deliberately saying here that "I am the TRUE Son of God." “I know your works, love, service, faith, and your patience; and as for your works, the last are more than the first. It’s important to remember that this church had notable works, and those works seemed to be getting better: "the last are more than the first" - your works are getting more impressive... We’ll come back to this idea in a second. After what we just covered regarding Jezebel in the Old Testament, do you think this Jezebel here was trying to teach the church to openly defy God? To blatantly denounce God and replace Him with one of the gods worshipped by those in Thyatira - Apollos, or one of the gods of the trade guilds? What Jezebel taught was tolerance. When it talks here about teaching and seducing My servants to commit sexual immorality, maybe that is a physical reference. It probably was, if you study the religious practices done to worship these other gods. But the heart of what this means is: Jezebel was teaching God’s people that it’s okay to dabble. You don’t have to leave God, but why not be open to something else too? After all, who are you to say what they are doing isn’t valid also? But try to imagine what that church would have looked like if you had moved into Thyatira 2000 years ago. They were open and inclusive. We accept you for who you are and love you no matter what. As we saw in verse 19, they were shining examples of service - they showed commendable faith, they were patient and loving, and they were growing in these things. Like Elijah, on top of Mt. Carmel... you make a stand for the truth. If the Lord is God, follow Him; but if Baal, follow him. Take a stand for the truth, and you will be vilified. Because standing for the truth is committing the one unpardonable sin in a tolerant society... Intolerance. That is the ultimate dagger thrown out today. How much has the culture around us influenced our own thinking? Has Jezebel seduced us? The Truth of God is very INTOLERANT of sin. The Truth of God is EXCLUSIVE. If you sin, you're not a part of the program. And I gave her (Jezebel) time to repent of her sexual immorality, and she did not repent. This tells me that the Jezebel it’s referring to in this message was a part of the church in Thyatira. God shows Jezebel some tolerance, just like he showed Ahab. However, that tolerance has limits. It doesn't compromise the Truth. Some of the commentaries I read say this verse indicates that this attitude will be in some of the people of God, at the end of this age, when that prophesied time of great tribulation will come. That sounds harsh, but we’ve talked about already when looking at Ahab, the devastating consequences of this mindset being passed down from generation to generation. It’s important for our children that we, as a church, hold fast to the truth of God. and all the churches shall know that I am He who searches the minds and hearts. And I will give to each one of you according to your works. Let's flip over to Psalm 119 for a second... I just want to bring out one thing here that I think is important. In my Bible I’ve connected this verse with Psalm 119:9-16 because David in this Psalm so eloquently elaborates on what Christ is saying to Thyatira. If we declared them, how would those judgements go down today? David sought to hide the Truth of God in his heart, to never forget it. Do we have that same passion for God’s truth? Do we seek to hide God’s truth in our hearts? Or are we open minded, searching for alternative truth other places too? Flip back now to Revelation 2. “Now to you I say, and to the rest in Thyatira, as many as do not have this doctrine, who have not known the depths of Satan, as they say, I will put on you no other burden. So Christ is commending those who haven’t bought into Jezebel’s teachings, who have stayed committed to the truth of God. But look at that phrase there: who have not known the depths of Satan. Many commentaries believe that is a reference to Gnosticism, a certain belief system that was gaining ground at the time John was given this message. That could be the case, but I think that Christ here is exposing the fundamental source of Jezebel’s deception. It all comes back to that moment in the Garden of Eden, when Satan sold Eve on the Tree of the Knowledge and Good and Evil. It says earlier in this message to Thyatira that Jezebel teaches and seduces My Servants. In the garden, Satan seduced Eve with the fruit. It sounded like it was going to be nourishing to the body, it looked good to the eyes, and it was desirable to make her wise. Satan seduced Eve with the teaching; You won’t surely die. God knows that when you eat of this fruit you will be like Him, knowing good and evil. Eve bought the lie because without the truth of God, she couldn’t tell the difference between the Tree of Life, and the Tree of the Knowledge of Good and Evil. Ahab bought the lie, because the truth of God had been slipping from his family for generations, and he couldn’t see the difference. The question today for us is; have we also bought that lie? Do we hold fast to the Bible as the one source of truth? Or is it ONE of MANY in our life? Think about what Satan was offering to Eve back in the garden - power, prestige, wisdom, influence. What would Jezebel would have seduced Ahab with? Christ is saying; when I see someone that won’t tolerate the Jezebel’s in their life, that won’t mistake the Tree of Good and Evil for the Tree of Life... to that person, I trust them to have My power. (Because God's tolerance only goes so far). There are many ideas on what this means. I think the best interpretation is that Christ is offering the people of Thyatira who overcome, the chance to become a part of the family of God. We today are exposed to more religious ideas via the internet and social media than any other generation before us. And in this glut of ideas, the world has become blind to truth. Any degree of certainty regarding what truth is has begun to sound offensive to our post-modern ears. There is so much more we could say about this, but let’s conclude with I Timothy 3. “Take an uncompromising stance on almost any doctrine or biblical issue, and a chorus of voices will call you obstinate, unkind, heartless, contentious, unloving, not matter how ironically you frame your argument. That ethos is why it is no longer permissible to deal with biblical issues in a straightforward and uncompromising fashion. Those who dare to take an unpopular stand, declare truth in a definitive way – or worst of all, express disagreement with someone else’s teaching – will inevitably be marked as troublesome. Compromise has become a virtue while devotion to truth has become offensive." Lloyd-Jones, M., 1971. Preaching and Preachers. 1st ed. Grand Rapids, Michigan: Zondervan Publishing House. Thyatira was a church that had a great resume on the outside. It was open and inclusive. It’s a church that on the surface, I would want to be a part of. But it allowed the tolerance of Jezebel to take away the intolerant truth of God. We today, live in a society, that is very similar. How much has that concept of tolerance that is all around us, impacted us? ... I write so that you may know how you ought to conduct yourself in the house of God, which is the church of the living God, the pillar and ground of the truth. Are we like David... actively mining and hiding the truth of God in our hearts? Are we like the Bereans... searching the scriptures daily for truth? Or are we like Ahab... God is in the mix, but so are a lot of other things? Are we like Thyatira... Are we being seduced by Jezebel? Are we giving up truth... and replacing it with tolerance?